Thailand abounds in a rich variety of fruits, but at this time of year enthusiasts seek out the special pleasures of the king and queen of fruits-durian and mangosteens. For connoisseurs, there is no better place to work up an appetite than in the orchards of Chanthaburi and Rayong. The mouth-watering taste and exotic smell of durian has impressed foreign visitors, especially those from Hong Kong, Taiwan, Malaysia and Singapore among others. Durian has become so popular that in the last two years, Chanthaburi has drawn sizeable crowds to its World Durian Fair. "It used to be a headache for provincial governors to sell all this durian before it turned rotten," an official of the Tourism Authority of Thailand joked recently. Chanthaburi and neighbouring Rayong boast soil and growing conditions ideal for durian. But the two eastern provinces are also known for their bounty of rambutan, lychee, longong, papaya and mangoes-all are abundant at this time of year. The best place to go is straight to the source: Some orchards are now open to tourists who can pick and sample fresh fruit. The Tourism Authority of Thailand is encouraging more orchards to open their gates as part of a growing trend toward agricultural tourism, said Chawaikit Rattanakup, director of the regional TAT office. The idea is not completely new. Some orchard owners used to welcome visitors but they found that many tourists lacked understanding and sensitivity. They picked immature fruit from trees and damaged overall production. "We have to educate [tourists] and create a better understanding about the idea of agricultural tourism. Now it is more clearly understood," Mr Chawaikit said. In Chanthaburi, three orchards that are open for visitors: Suan Pai Thong, Suan Wong Wit and Suan Sadetyad. 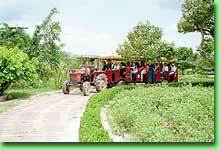 The owners are younger farmers with some novel ideas and a good understanding of the agricultural tourism idea. At Suan Wong Wit, for example, owner Kris Wongwit encourages visitors to take leisurely walks in the orchards. There are also demonstrations of fruit picking as well as processing. Another mouth-watering attraction is the chance to consume an unlimited amount of fr At Suan Supattra Land in Rayong, the owners began taking steps to accommodate tourism three years ago. Visitors to the 700-rai site can take a sightseeing trailer (for an average of 20 baht per person) or rent a golf cart (200 baht an hour) to see the entire spread. The orchard is clearly divided into separate cultivation areas for durian, rambutans, mangosteens and so on. There is also a park with a pool and artificial waterfall for visitors. A bird park is on the drawing board as an added attraction, a guide said. Some travel agents in Taiwan, Hong Kong and Malaysia have already added visits to the farm to their clients' itineraries. To take advantage of growing tourist interest, the eastern provinces have been expanding their annual fruit fairs to include a variety of activities plus the sale of handicrafts and other products. The first half of the year is the best time to visit Chanthaburi and Rayong when the supply of fruits is abundant, but efforts have increased to promote the provinces as all-season destinations for people interested in nature tourism. Pong Nam Ron district in Chanthaburi is seen as a potential showpiece. Twenty years ago, the district near the Cambodian border was known, if not feared, as an enclave of communist insurgents. Today it is seen as an attractive destination blessed with cool weather and good rafting streams. Two tour operators pioneered rafting trips in the area last year, and the Tourism Authority of Thailand believes local people need to become more involved if the district is to fulfill its promise as an eco-tourism site. Wang Khon Chalet is one of the local operators. "I have lived here since I was born. I swam in this klong when I was young so I knew its beauty, especially when I discovered the rafting route," said owner Poonpongsak Rungpracha. "This can be an ideal rafting spot. 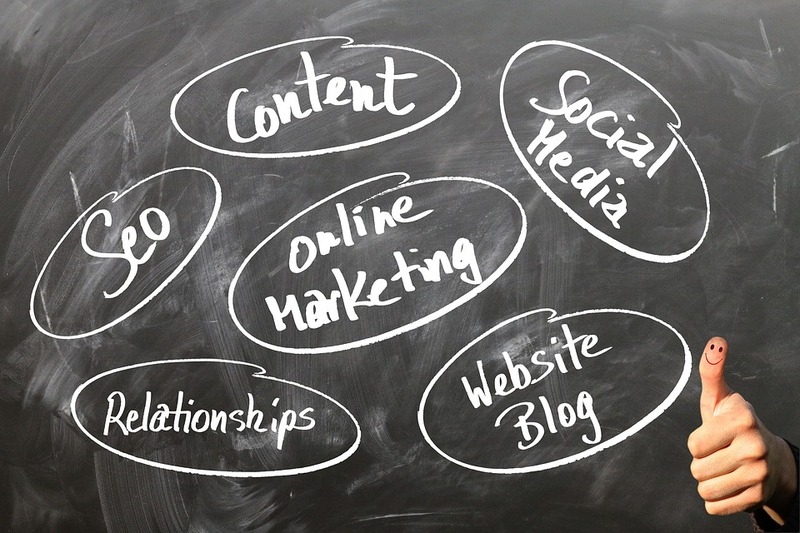 Both adults and youngsters can enjoy the activity together." The seven-kilometre Klong Pong Nam Ron is graded level 2-3, making it accessible to rafters without a great deal of experience. It now attracts as many as 1,000 visitors a day during the peak season. The TAT is also developing the Khao Chamao-Khao Wong national park for ecotourism, with the recently discovered Klong Pla Kang waterfall as a magnet. Covering 52,300 rai and straddling Rayong and Chanthaburi provinces, the park boasts fertile, pristine forests and a good selection of wildlife. Besides the Khao Chamao waterfalls, Morakot cave is a highlight. The 33-year-old park attracts about 300,000 tourists a year, mainly local people. The Klong Pla Kang waterfall has been an exciting find, and the Forestry Department is working with the TAT on ways to ensure that it can thrive as a sustainable tourism development. There are strict controls, for example, on bringing non-biodegradable materials into the park. Khao Chamao sub-district in Rayong, just 170 kilometres from Bangkok, is home to the Chamao Ranges and the last undisturbed forest in the province. The population of about 20,000 makes its living from hillside orchards of durian, rambutan and mangosteen. The area's relative remoteness has helped preserve its natural beauty. Formally established as a sub-district six years ago, Khao Chamao will stage anniversary celebrations from May 29-31. On the schedule will be a reforestation exercise focusing on the planting of rare trees associated with local legends, as well as herbs. As well, a cross-country mountain bike rally is planned along a hillside route that passes the Khlong Plakang and Khao Chamao waterfalls, the Khao Chook reservoir, fruit orchards and rubber plantations. Participants can choose routes of 15, 25 or 40 kilometres. The event will begin with an early-morning offering of alms to monks. For more information, contact the sub-district office at (038) 969238-9. By car: Take Sukhumvit road No 3 from Bangkok via Pattaya, Ban Chang, Rayong and Chanthaburi (291 km); or Highway 36 through Chon Buri, Si Racha and Rayong (254 km); or Highway 344 via Chon Buri and Klaeng to Chanthaburi (245 km). By Bus: Both air-conditioned and regular buses leave the Eastern (Ekamai) bus terminal (391-4164) every day starting from 5 a.m., with the last buses returning at 11 p.m.
Fruit farms:The best time to visit fruit farms is in the first half of the year with the peak harvest season in May. *Suan Wong Wit in Chanthaburi, (01) 861-6258. 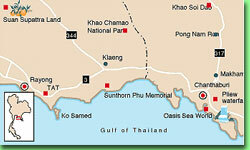 *Suan Supattra Land in Rayong, (038) 892048-9. Reservations must be made in advance. 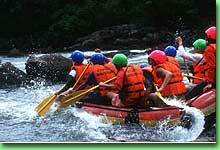 Rafting: The best time to go rafting in Chanthaburi is during the rainy season from June to November. To arrange outings, contact Wang Khon Chalet (01) 663-7089; or Yiwa Tour (039) 322904, 312964. * Maneechan Resort and Sports Club, (039) 343777. * Wang Khon Chalet, (01) 663-7089. For more information on Chanthaburi and Rayong attractions, contact the TAT regional office, (038) 655420-1, 664585; or the Chanthaburi Tourist Business Association, (039) 663708-9.